Before I get to the various tours and talks, I have several people I want to thank for all their efforts over last Saturday and Sunday. Firstly, I would like to thank Craig with Clive and Colette who had their usual bookstall and book signing table in the Old Sessions foyer. 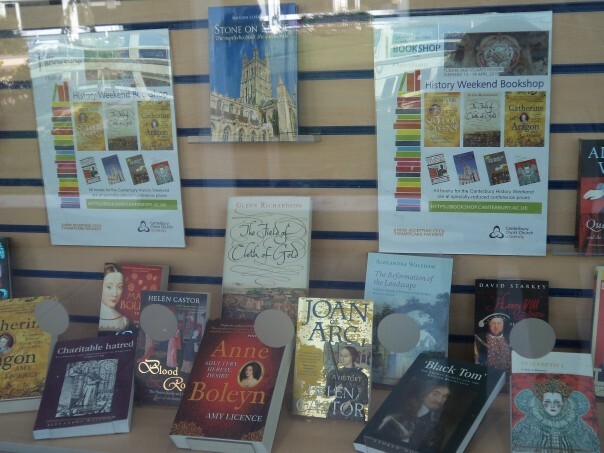 Indeed, such is the fame of the bookstall that a couple came in on the Sunday who have attended these History Weekends before but hadn’t been able to this year and they came solely to check out the books. Then, in no particular order, I would like to thank the three CCCU teams in Hospitality, Facilities and Security who respectively staffed the kiosk in Old Sessions amongst other things, set up the tables and chairs in the foyer and in the break-out area [Og12], and opened up the building, as well as repositioning the disabled lift in the Michael Berry Lecture Theatre to a much safer position. Additionally, Terry Davey, from the AV team, checked all the microphones and computers beforehand. Albeit there are only certain areas in the lecture theatres where the hearing loop works well (as displayed on the plans outside Og46). 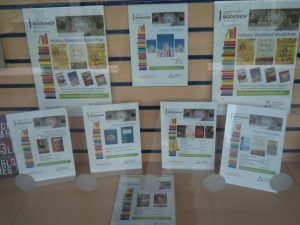 Here I also want to mention Ruth Duckworth in the Augustine House Box Office. She has coped magnificently with some very tricky queries and just setting up the complex History Weekend on the booking system, with Matthew Crockatt’s input regarding the Centre’s webpages, is an amazing feat of organisation. The student ‘Welcome Team’ members did a great job all weekend. The two lecture theatre teams were led by Lily Hawker-Yates and Dean Irwin, both doctoral students, who each had a mix of undergraduates and taught Masters postgraduates to ensure everything was running smoothly, including looking after the hand-held mics for the Q&A sessions, checking tickets and helping people as necessary. Lily’s team comprised Edward Younger, Poppy Osborne and Jacie Cole, while Dean had Michael Byrne, Joshua Rhodes and Bradley Chipping. In addition, Lynn Turner was busy working with Mary-jane Pamphilon, our Reception Manager, to ensure people could collect their tickets, book more events, buy a souvenir brochure and find out any necessary information for them. My co-organiser Dr Diane Heath and I were also fortunate to have the assistance of our deputy, Dr Abby Armstrong, who has been a stalwart at these Weekends for several years, including chairing sessions. Several staff members from the School of Humanities were present – giving talks, chairing sessions or both, and I would like to thank Dr David Grummitt, Head of Humanities, as one of those who did both, as did Dr Astrid Stilma and Professor Jackie Eales, one of the Directors of the Centre. Even though it is not her period of history Professor Louise Wilkinson, the Centre’s other Director, was similarly on hand to help, including chairing and being CCCU’s representative on Paul Bennett’s two tours: the Tudor King’s School (my thanks to the headmaster Peter Roberts for access) and the Tudor Christ Church Gate. I am sure many of you remember Paul for as well as being the Director of Canterbury Archaeological Trust, he is also a Visiting Professor in the Centre. Acting as the CCCU representative at the two excellent Canterbury Cathedral Archives & Library’s special exhibition tours for the Weekend was Matthew Crockatt, and afterwards he came down to Old Sessions to take more photos which will in due course appear on the Centre’s webpages, see previous History Weekends – our legacy activities. Dr David Budgen, our modern history colleague, very kindly came and chaired a session and the rest of the chairing duties Diane and I shared, while Diane also spoke on ‘Early Modern Monsters’ on the Saturday. Hopefully some of you will have followed the twitter feed during the Weekend and we hope to provide that as another legacy strand soon. However, because I was chairing five sessions and when I wasn’t I was doing other things outside the lectures, I’ll just report on those I chaired with some snippets about other speakers I heard about from our great audiences who were thoroughly engaged all weekend long. In fact, I’ll take this opportunity to thank all the speakers who delivered fascinating talks, answered questions in the Q&A sessions and often afterwards, signed books and generally engaged with people. Similarly, I would like to thank all those who came, without you these History Weekends would not work and I should like to report that as well as a large contingent from Kent, London and the South-East, people came from across the British Isles – from Orkney to Cornwall via Sunderland, Leeds, Cheshire, Northampton, Newcastle-under-Lyme, Birmingham, Bournemouth and Plymouth. Wales and Ireland – north and south, were again represented, as was the Isle of Man and we also had people from Minnesota across the Atlantic. 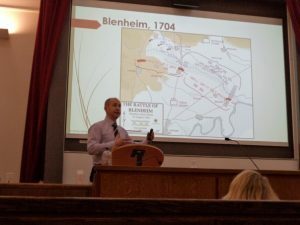 As in previous years there was a definite buzz of excitement and engagement throughout, and, as one person wrote, the best part of the Weekend was the “chance to listen and speak to historians whose work I am interested in, and whose careers I have closely followed”. On a similar theme, another wrote that what s/he had liked the most was “the informal, friendly atmosphere, mix of people, mix of speakers and subjects. Really relatable and informative lectures, fun – real intellectual buzz”. While others were also impressed by the “Great organisation, as usual” and “As ever a particularly well organised weekend with an exceptional range of great speakers”. So, what did people hear about? Well, I heard excellent reports about Dr Helen Castor’s lecture on Elizabeth I, which was appreciated by many, including at least one ‘A’ level history teacher who was thoroughly excited by Helen’s ideas on the monarch. 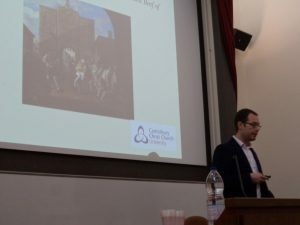 Dr David Starkey was equally appreciated for his ideas on Henry VII’s cleverly managed financial systems, and both, like Alison Weir (on Anna of Kleve) and Professor Andy Hopper (his funded national project on English Civil Wars pensions), spoke to packed lecture theatres. 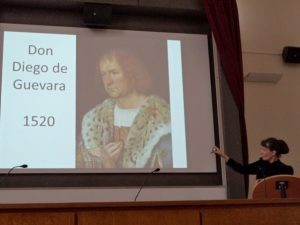 Professor Alexandra Walsham’s analysis of the English Counter-Reformation intrigued her audience, as did Dr Astrid Stilma’s exploration of the late Elizabethan and Jacobean debate on treason and its consequences for society. I was also sorry to have missed Dr Miranda Kaufmann’s assessment of the lives of three Black Tudors, a history topic that is coming out of the shadows. In some ways equally topical was Dr Ben Marsh’s consideration of the new settlers of early 17th-century Jamestown. For something different, the relationship between religion and society was important in chronological order for Professor Glenn Richardson and his analysis of Cardinal Wolsey, Amy Licence’s examination of French influences on the youthful Anne Boleyn, Professor Kenneth Fincham’s investigation of the making of the King James Bible, and Dr Rebecca Warren’s discussion on Cromwell’s attitudes towards witchcraft. I should just like to point out that both Amy and Rebecca had stepped in when we had ‘lost’ two speakers, Rebecca very much at the last minute for which I am hugely grateful, and in Amy’s case I am equally grateful and pleased because she is studying for her doctorate at CCCU. 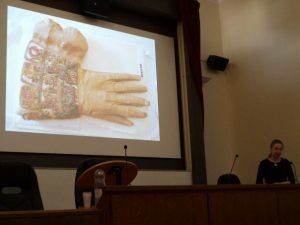 To kick-off the History Weekend, I chaired Professor Jackie Eales’ exploration of a celebrated ‘murder’ case that had no body but did result in the execution of three family members, a miscarriage of justice from the 17th century if ever there was one. 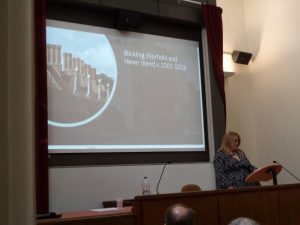 Moreover, Jackie used it as a way to look at contemporary attitudes towards criminals and witchcraft, and the perceived prevalence of slave raids by Barbary pirates – even apparently into land-locked Gloucestershire! This fascinating case and its repercussions engendered a lively discussion and thus a great start to the Weekend. I then moved lecture theatres and chaired Professor Maria Hayward’s fascinating assessment of how, when and why perfumes were used by royalty, to be copied by their social inferiors perhaps as far as the ‘middling sort’ in terms of lavender and other commonly available herbs. What for me, as well as others among her audience, was the sheer extravagance of this means to hide certain smells, as well as to bring out others. Nor was this the only usage and poison was certainly an issue for Elizabeth I and her ministers, whether we are talking poisoned gloves or the pommel of her horse’s saddle. This lecture similarly provoked a considerable number of questions and comments and people were still discussing it over the lunch break. After lunch, I chaired Professor Keith McLay’s analysis of Winston Churchill’s forebear, John Churchill the 1st Duke of Marlborough. 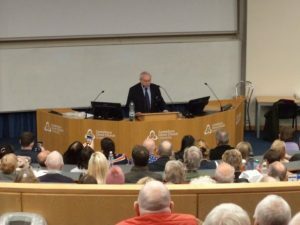 Indeed, Keith was keen to explain to his audience why John Churchill should have a greater claim in the annals of British history than Winston. In addition to demonstrating Marlborough’s tactical superiority on the battlefield on several occasions, and how his ideas had been used successfully by others thereafter, he discussed Marlborough’s remarkable abilities as a politician and diplomat in the complex swirl of English and continental grand politics. After a very enthusiastic round of applause, Keith responded to a wide range of questions and comments – another successful session. 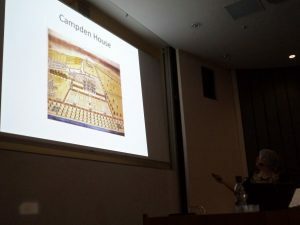 Sunday brought two further opportunities to chair exciting talks, the first being David Grummitt’s consideration of Calais and its hinterland as a ‘a little piece of Tudor England overseas’. Having explained how it had become an English outpost in the Hundred Years War, he then went on to explore how it was run on the lines of an English incorporated borough and its role as an important commercial (wool) entrepôt. He also discussed the garrisoning of Calais, and how this developed over the later Middle Ages and then under the early Tudor monarchs, including its place regarding the great meeting of Henry VIII and Francis I of France at the Field of the Cloth of Gold. However, as you might expect, he spent the last part of his lecture showing how Calais had been lost, largely due to the ineptitude of those at the top who acted too slowly in seeking help from England. The subsequent questions and comments again showed that people had been listening attentively and there was a fruitful discussion about the international nature of the Calais garrison. This brings me to the final session both of the Weekend and those I had chaired because after lunch I joined the keen audience in the ‘Old Court Room’ lecture theatre to hear Imogen Corrigan discuss a little known but remarkable Estonian Renaissance artist called Michael Sittow. Not that he spent his life in this Baltic state because he was, for example, the court painter to Isabella of Castile. Yet very little of his work has survived but what we know about is of the highest quality, something the great Albrecht Durer recognised, seeing Sittow as his equal. It was fascinating to see just why he was lauded by his peers, and rightly so, and Imogen provided an insightful biography of this multi-talented man who was a sculptor as well as a painter. 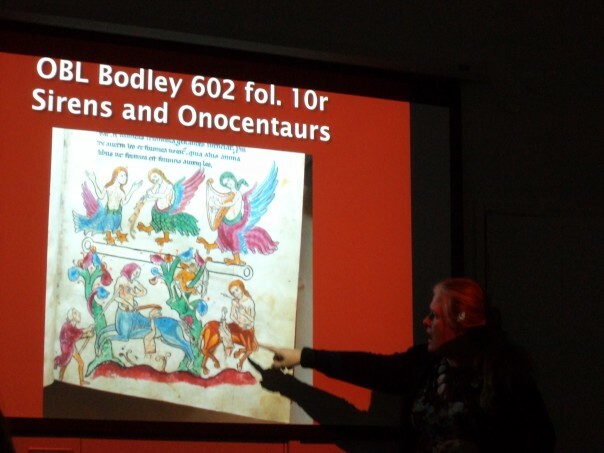 Her enthusiastic audience was keen to ask questions and it was a great lecture to complete the Weekend, just as Rebecca’s was in the Michael Berry Lecture Theatre. This brings me to the end of the Tudors and Stuarts 2019 History Weekend, which I think will raise another substantial sum for the Ian Coulson Memorial Postgraduate Award fund. The Centre’s next event will be an open lecture on Wednesday 8 May at 6pm in Old Sessions when Paul Bennett will consider ‘The Canterbury World Heritage site – an archaeological perspective’. I hope to see some of you there.